Got a French Bulldog fanatic or a lover of Labradors on your shopping list? Let them show off fun facts about their favorite breed with this gorgeous mid-century-style blueprint. It highlights the breed's history, temperament, and build alongside a large illustration of it. And if $265 is too steep, you can also get a pillow print for $95. For many dogs, especially longer-legged breeds, stretching down to eat from a bowl set directly on the floor can lead to digestive problems. Now, we're not suggesting that your dog eat at the table with the rest of the family, but why not let your dog at least eat meals at a table of its own? This pet table from Virginia upcycler Bob Yates is crafted from a semi-circular section of wine barrel that holds a pair of stainless steel bowls. Dog's don't drink the same way people do—there's way more tongue involved—so it's not like they can drink effectively straight from a water bottle like we do. This can be an issue if you and poochie are out romping around the woods and find yourselves parched. Rather than waste half a bottle letting your dog lap out of your cupped hand, simply unroll 120 oz, leak-proof Mud River Renegade Food/Water Bowl and let your dog hydrate with a bit of dignity. For some dogs, no amount of obedience training is enough to trust them off-leash. The second they spot a squirrel—boom, they're off and running. 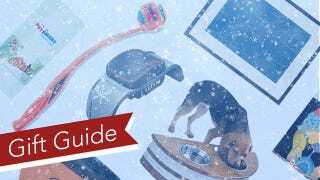 But with the new Tagg GPS-Plus pet tracker affixed to your dog's collar, you'll be able to track down your dog anywhere in the continental US right from your smart phone. It's also a handy device to have around should the airline put your dog's kennel on the wrong flight. The tracker regularly retails for $120, but it's currently on sale for $90 and PetTracker.com. If your dog's favorite activity at the park or beach isn't so much chasing sticks or sniffing butts as it is getting wet and rolling in what appears to be an organic slurry of decomposing seagull and fox vomit, the interior of your car is going to bear the brunt of that olfactory attack. And, believe you me, getting the smell of rotted bird carcass out of your back seat is nearly impossible. Instead, give yourself a gift this holiday in the form of the Solvit Waterproof Pet Hammock. It slings between the front and rear headrests, giving your dog plenty of room to stretch out, without letting him grind that stench into the seats. Looking for an innocuous gift for a distant dog-owning relation but don't really know (or really care enough to find out) what they really want? Boom—Chuck-it. It's a classic, it's 12 bucks, who's next on the shopping list? If your dog is more than just a pet but a beloved member of the family, what better way to immortalize him than with a custom portrait from Etsy artist Matea Sinkovec? It may not be as high-tech as having your dog cloned, but it's a heck of a lot more affordable. If you never, ever want to let go of your pup, what better way to hold on is there than with this clever xenomorph leash harness from Storenvy? It's a bit pricey at $150 and only fits 15-35 pound pooches, but it's way better than that Hanibal Lechter muzzle you've had your eye on.